Whether you’re new to journal writing, or have amassed several volumes of journal entries, a new year is always a great opportunity to reflect, plan, and make goals for personal growth and enriching your life. The following is a set of recommendations for using January to start developing a journal writing habit, to pull out your old journal and start again, or just continue the journal writing habit you’ve already developed. Journal writing will always remain a useful and reflective way to explore your life, record memories, and solve many of life’s challenges. Now that the holidays have wound down, January is still a great opportunity to reflect on your experiences, goals and challenges of last year. I wrote an article that goes into more detail about year-end reflections that you might want to check out. It includes a set of journaling prompts that help you get started. Yes, I know, making resolutions can sometimes feel like a lost cause, but I still think that when you write down your goals and resolutions, and if you keep coming back and reviewing and reflecting on your goals and resolutions, you’ll achieve a lot more than if you don’t engage in this process. So spend several days in January writing in your journal about your goals and resolutions. Don’t do it just one day, set up several calendar reminders to reflect in journal about how you’re progressing toward your goals. Henriette Anne Klauser’s Write It Down, Make It Happen: Knowing What You Want And Getting is also a good book to read about the power of writing and making things happen. Through journal writing, you’ll discover how to get more benefit from everything that you’ve experienced. In the process, you’ll discover that what you’ve learned from being a survivor has enriched your life beyond anything you’ve ever imagined. Use January to start a gratitude journal. I’ve started reading Janice Kaplan’s new book, The Gratitude Diaries: How a Year Looking on the Bright Side Can Transform Your Life, and I have decided to set up a separate journal in my Day One journaling habit to write about gratitude during the month of January, and regularly throughout the year. I don’t feel the need to write gratitude entries everyday, but I do want to write and remind myself about the positive things going on in my life, and how I can help enrich the lives of my family and people that I don’t meet. No matter what your financial status is, it’s always important to be very clear about your finances. Spend a week or two each day writing about the money you spent or didn’t spend. I got the idea from Refinery29.com which maintains a column of money diaries by women. Read this example of money diary. I’ve completed two week-long money diaries, and they have been very helpful reminding me not to spend money when I don’t need to, and to reflect on ways I can budget better, though I do keep a pretty tight budget. While I realize that traditional journal writing involves a pen and notebook, I discovered six years ago how useful it is to keep a digital journal. I have box of paper journals that I will always cherish, but since I switched to using Day One five or six years ago, I’ve done a lot more journal writing, and I use the On This Day feature to review what I’ve written in the past. My digital journal is always with me, and I really don’t feel my journal writing is less reflective or meaningful by typing entries instead of handwriting them. If you haven’t tried digital journaling yet, check out my guide to digital journals to get started. 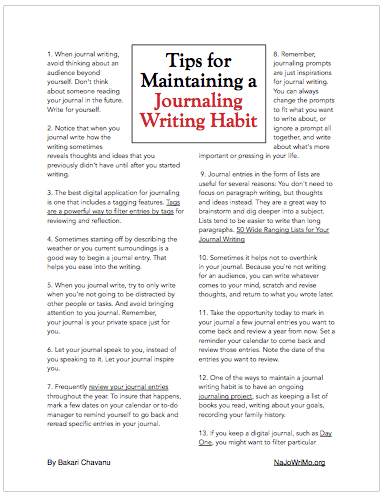 Ever since I started National Journal Writing Month, I have recommended the use and power of thematic journaling as a way to use journal writing for personal growth and enrichment. What thematic journaling challenges you to do is focus on a theme for an extended period of time, and let your writing guide you through self-discovery. To do thematic journaling, choose a theme or topic you want to journal about during the month of January. A theme might include building relationships, overcoming a loss, meeting challenges, exploring what it means to be happy, exploring your personal identity, eating better or losing weight. The standard theme for NaJoWriMo January is Personal Growth and Setting Goals Through Journaling. The themed course consists of daily journal writing prompts emailed to you daily through the month of January. To use the prompts for the January challenge, be sure to order your prompts on December 31st. Or you can order the most recent theme, The Happiness Journal.